Breast form adhesive kit including spray adhesive, bottle of remover and Skin-Tac adhesive wipes for maximum hold. The breast form adhesive kit to ensure maximum hold and to make your adhesive last much longer. Hollister is our recommended medical spray adhesive which is safe and gentle enough to use on skin but tough enough to keep your breast forms in place all day. We also have a version of the kit with a 24 bag of double sided medicall tapes in place of the Hollister if you prefer. The Walker remover is gentle on your breast forms so that a quick application and gentle rub with cotton wool followed by a water and soap wash and rinse is all you need to clean your forms thoroughly. Sorry, no coupons permitted with this product. But now you get in this complete kit the 25 Skin Tac Adhesive Barrier Wipes. Simply rub on the skin area where forms will be applied and allow the Skin Tac to dry to a tacky feel. Then attach your forms using your chosen adhesive applied to the breast forms onto the skin and the Skin Tac is like a base so that you get an even stronger and longer lasting bond. If using the Skin Tac with the Double Sided Medical Tapes version then peel the forms gently off the skin after wearing leaving the tapes on the forms. 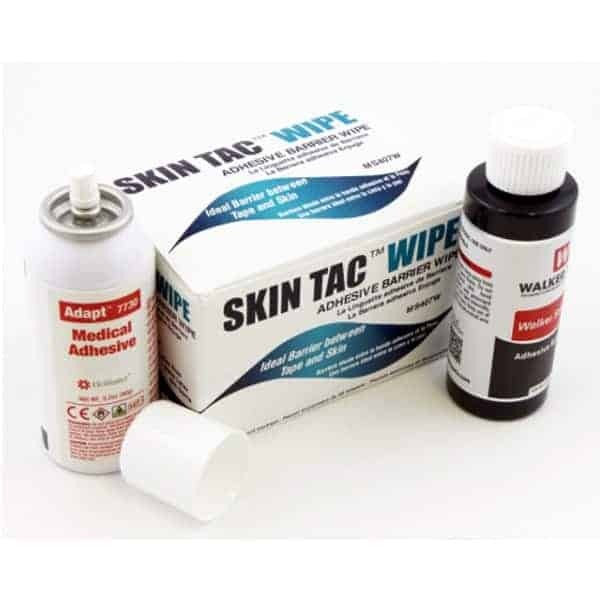 You can then rejuvinate the adhesive on the tapes before applying to the body next time simply by rubbing one of the Skin Tac Wipes on the tapes surface. You can often get 2 to 4 uses from the same tapes this way. Skin Tac Wipes should be replaced in their foil wrapper and then in a small resealable food bag which will keep the wipe moist and able to be used again. Both the Hollister and the Double Sided Medical Tapes version will last you much longer when you use the Skin Tac in this kit.